And I forgot to buy any! I really liked the display by the Scottish Begonia Society, Mark. A stunning combination of all types. Will post a couple of pics soon. such a shame u forget... this is so lurveely! I cannot find these in my area...alas. I would probably need to lift them every year anyway...sour grapes. I will love yours instead. This blue poppy has been filed on my blue-flower photo favourites. Thanks for this one, David. Its absolutely awesome! I HAVE to have these! So do I - but I need a theme to fit them into. You have the perfect one! Yes, the Garden is open to the public. You must be only a mile or two from there. Cross the main bridge over the River Tay in Perth. Turning to the left leads to the main routes to Blairgowrie (and to Scone Palace). You should turn right (there's a hotel here, but can't remember the name offhand). Branklyn Gardens are signposted not far down this road, on the left hand side). You can always Google the name and get a printable map? The garden is actually on the slopes of Kinnoull Hill. Oh, right!!!! I know where it is! Thanks, I think I've seen it signposted, it's up behind the Isle of Skye Hotel! Ah good, I'll know where to go then! LOL! I really DID laugh at that one! great to revisit... Hi David! How has your summer of 2009 been? 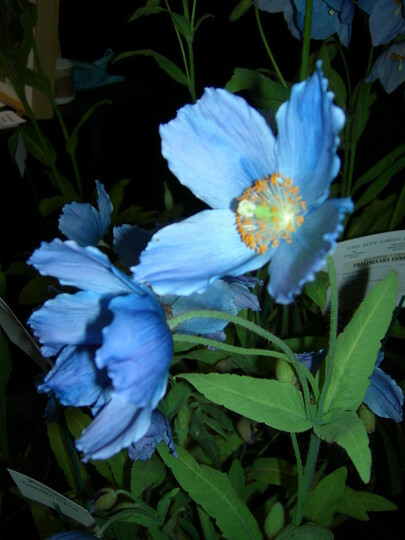 See who else is growing Meconopsis betonicifolia (Himalayan blue poppy). See who else has plants in genus Meconopsis.